It's time for a sane, sustainable energy policy in America. After 26 years of failure and delay on the part of the Department of Energy (DOE) to submit a license for a permanent repository for nuclear waste, it may be true the political wheels have ground slowly since the 2008 submission. But perhaps what took the DOE so long to submit the application in the first place, after the 1982 Reagan-era decision mandating that the DOE had to do so, was exactly what ground the political wheels to a halt: Yucca Mountain is bad science (see documents from Nevada; links below). San Onofre Nuclear (Waste) Generating Station, shut down exactly two years ago today (January 31, 2014) due to a radiation leak and premature wear from defective steam generators, and closed permanently last June (2013) still has approximately four million pounds of high-level nuclear waste on site; and it's not going anywhere any time soon. The waste is so toxic that merely a pound or two carries enough deadly poisons to kill off all of humanity, if it were evenly distributed. San Onofre's four million pounds of spent nuclear fuel is one of a number of sites in California with large quantities of deadly nuclear waste: Humboldt Bay, Sacramento, San Luis Obispo... and quite a few military reactors in San Diego Bay... and who knows where THAT waste has gone or will go in the future? When talking about the "77,000 tons of nuclear waste" waiting to go to Yucca Mountain, people often forget that that is only the "commercial" nuclear waste. It's just the used reactor cores from commercial nuclear power reactors. That figure doesn't include the military reactor disposal problems the nation is incurring. Military reactors are vastly more radioactive (and thermally much hotter too, for far longer periods) than civilian used reactor cores. What's to become of them? Regarding the civilian reactor disposal problem, has California paid enough money to get rid of its nuclear waste? There is a fund for doing so: Californians have been paying into it for several decades. But it's hardly big enough to cover the cost of disposal -- assuming a permanent disposal site will exist, which is a big, big assumption. The nuclear industry has been making that assumption for 65 years with no evidence whatsoever -- and plenty of evidence suggesting there is NO safe place, no community that wants it, and no safe transport method to get it there anyway. But leaving it where it is, is an even worse option! There are approximately 10 million pounds of highly radioactive, toxic, extremely hot used nuclear fuel sitting in various places within the state of California. More than 10 million Californians live within 50 miles of a "temporary" nuclear waste storage site. Temporary? When the reactors were proposed to the public and construction began, none of the waste was supposed to stay on site for more than a few MONTHS! Some has been sitting for upwards of four decades already, and counting. That's why the spent fuel pools where most of the waste is currently stored are so dangerously overcrowded and so small -- because the waste was never supposed to remain on site. Each spent fuel pool is larger than an Olympic-sized swimming pool, but far smaller than what they actually need to safely store the waste. So for the last dozen years, they've been offloading the waste into "dry casks," which are more dangerous in many ways, safer in others, and the Nuclear Regulatory Commission (NRC) approved an endless stream of them -- in all their calculations of "safety" they always slither out of comparing dry casks or spent fuel pools -- or operating reactors, for that matter -- to the far safer, less costly, clean renewable energy alternatives and thus not generating the waste in the first place. The basic assumption by the NRC is that the reactors will operate. Every other aspect of the nuclear business seems trivial to them by comparison. Waste disposal is described repeatedly by upper-echelon NRC officials as "a very tiny part" of their responsibilities. In reality, it's the most important part, and they've been practically ignoring it for decades. Can California get rid of the waste for $50 per pound? GOOD LUCK! There is a lot of industrial waste you can't get rid of for that amount, and nuclear waste is much, much harder to dispose of than anything else humanity has ever produced. So good luck with that. California utilities have been collecting a PALTRY $16 million a year collectively from ratepayers, but during most of that time California's nuclear power plants were producing an average of 1000 pounds per day of high level nuclear waste, with four reactors operating (two at San Onofre and two at Diablo Canyon). Neither the waste fund nor the decommissioning fund do anything to fund the interim nuclear waste storage that will be needed at San Onofre and other reactor sites for the next couple of centuries -- or at least decades -- which is ALSO the time that the waste is the most hazardous. Right now the waste is hundreds or even thousands of times more radioactive than it will be in a few centuries. now is also when the waste is most vulnerable to a catastrophic accident, because it is thermally hotter, and both the heat and the radioactivity make it more difficult to handle. (And although it gets easier to handle, it will take about a million years before it's not a threat to humanity and will not require some sort of isolation). There are no funds for repackaging the waste more safely, or for moving it away from the earthquake and tsunami areas where it now sits, nor for doing anything with it at all besides have someone with a pea-shooter watch it and walk around it a couple of times per shift. Any problems with spent fuel in dry casks -- including obvious and foreseeable ones, like cask or content degradation -- are not covered by the decommissioning funds nor the permanent repository fund. The real status of the fuel is in limbo, but universally, the nuclear industry, the regulators, and the politicians would all like YOU to forget about it. But you do so at your own risk! To make matters worse, for the last dozen years or so, the nuclear power industry has been creeping up the amount of the typical nuclear fuel enrichment (the percentage of Uranium-235 to Uranium-238). They've also been "down-blending" weapons-grade uranium and uranium/plutonium "pits" (cores) from old, outdated nuclear weapons, mostly from Russia. They call this "recycling" because it sounds green, but it is actually a highly complex, chemically-intense and energy-intense industrial process, which leaves an enormous hazardous waste stream, much of it radioactive. The more highly enriched nuclear fuel lasts longer in the reactor, but comes out over twice as radioactive for the same reason -- more atoms have been split, producing more fission products (radioactive Cesium, Strontium, Iodine, etc.) and more activation products as well (such as Plutonium). Storing the spent enriched fuel (called "high burnup fuel") is much more difficult than storing normal or "low burnup" fuel. But storing nuclear fuel is never easy or safe, which is why a national repository has been on the agenda practically from the beginning. The so-called "commercial" nuclear power industry could never make it in a truly free market, and it's not just because of the global hatred of it, which it rightly deserves. Ignorant people might not despise nuclear power, they like to flip a light switch and "let there be light." But the vast majority of people who ARE educated about nuclear power despise it. Those that don't -- tend to make a living from it, or did so for most of their lives. The nuclear power industry is an industry which operates with essentially NO insurance, yet it can cause trillions of dollars in damages and hundreds of thousands of deaths in just one accident -- and according to some who have tried to calculate the effects of Chernobyl and Fukushima, it already has. It will again unless it is stopped somehow. The nuclear power industry is an entity with virtually no public accountability -- in fact, it's so secret, the government's own nuclear regulator, the NRC, isn't privy to the industry's own self-regulating body of information, collected by the Institute of Nuclear Power Operators (INPO). The public doesn't stand a chance of ever seeing these records of thousands of "minor" accidents and hundreds -- yes, hundreds -- of near-catastrophes. Well, okay, there's always a chance of a nuclear Snowden at INPO (or at the NRC, which also keeps a lot of secrets for the industry, claiming the information is "proprietary" for one reason or another), but don't hold your breath. It's not a profitable industry for society as a whole, although utility shareholders and owners do make money: Trillions of dollars have been provided to the nuclear power industry over the years, in the form of public funding for research and development of nuclear power. In addition, during operation, most of the industry's profits are mandated by state Public Utilities Commissions, at least in California, which ensure the utility will make a profit regardless of their failures, such as failing to lower the cost of producing electricity by using renewable energy resources instead of nuclear power. The utilities don't need to worry about operating the plants cost-effectively because the commissions will ensure they make a profit anyway. The utilities, with their gigantic 500 to 700 megawatt coal-fired plants, their gas peaker plants, and their enormous 1100 megawatt nuclear reactors -- don't want you to put up 10 kilowatt solar panels on top of your home, let alone 5 megawatt wind turbines on your farm (despite any public gesticulating to the contrary). Every renewable watt generated independently cuts into their business instantly. Every wind turbine, every solar rooftop, every electric car that's powered by locally-produced renewable energy is potential business that's lost forever to the utility. A typical solar rooftop these days can power your entire home, charge up two Electric Vehicles, and still have enough left-over capacity to charge your neighbor's EV as well. The utilities fight against this tooth and nail, to such an extent that they are willing to ram millions of pounds of deadly nuclear waste (77,000 tons of it nationally so far) down our throats, into our communities, and coming out our faucets as the industry's poisoned rainwater carries radionuclides from Three Mile Island, Santa Susana, Chernobyl, Fukushima Units 1, 2 and 3, and a thousand other smaller spills and accidents. These effluents flow from the reactors to the rivers, to the ocean, to the rain, and into our bodies. They are ingested by the fish, by the plants, and by the animals, and we eat them. Some radiation is delivered more directly: Recycled metals become children's braces and cookware. Radon, released during uranium mining operations, wafts across the country. And ozone-depleting chemicals pour out of the nuclear fuel fabrication facilities (which, for reliability and to keep costs down, are usually powered by coal). 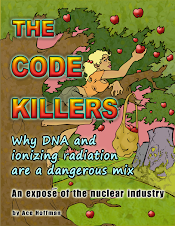 The ever-increasing collection of spent (i.e., irradiated and fissioned) nuclear reactor core fuel assemblies is so hazardous that a human would be dead in less than a second if they ever got near unshielded nuclear waste. Unfortunately the best shielding is impractical not just because it costs a fortune, but because there simply isn't enough of it (for example, gold or iridium). Typical shielding is lead, steel and cement, which deteriorate with time. How much time before today's waste becomes tomorrow's environmental disaster? Who knows, but the thickness and type of metal, the quality of the welds and bolts, the level of fuel burnup, and degradation from the environment (especially ocean environments), all can potentially be a factor if there is a problem. Decisions are made based on industry profitability more than safety. The NRC requires dry canisters meet ASME manufacturing standards, but doesn't require an ASME stamp, which would certify the canisters have been manufactured and inspected to meet the top safety standards. (See link, below.) Right now there are about 1,800 dry casks of deadly nuclear waste stored "forever" around the country and about 130 spent fuel pools holding the rest, and about 10 tons more waste are created every day. 77,000 tons is the result of just the first few decades of the nuclear power industry. More dry casks are being fabricated every week -- purportedly to relieve the overcrowding in the spent fuel pools, but really, just to make room for more fuel to cool IN the pools! By the end of this century, barring the permanent closure of most or all of our nuclear power plants, America will have approximately 10,000 dry casks scattered around the country -- a breach of any one of them would be an environmental disaster, whether caused by an airplane strike, or terrorist attack, or...??? Will they all be made properly, to industry specifications? NO. Are those specifications good enough? No again. We've heard numerous disassociated whistle-blower revelations from the fabricators themselves. It would be foolish to think that the casks are all properly made. The Nuclear Regulatory Commission, however, ASSUMES that every dry cask will be properly fabricated. This fact was revealed during hearings about the loss of generating capacity at San Onofre, when the NRC admitted that all 40,000 of the four new steam generator's inner heat transfer tubes were assumed by the NRC to be correctly manufactured -- and thus, the fact that thousands of them were failing was assumed NOT to be due to manufacturing failures that should have been found in testing and inspection. That's right: The NRC requires numerous inspections and does a small number of inspections themselves (although I don't think they ever went to Japan to inspect the steam generators during fabrication, when they actually could see the inner parts of the systems). Even though these inspections occasionally do turn up anomalies and problems, the NRC nevertheless assumes that everything was fabricated properly, whether they or anyone else inspected it or not. If the public had any idea how bad things really are throughout the nuclear industry -- and how clean and simple the alternatives are -- it would demand the closure of every commercial nuclear power plant in an instant -- and the military ones, too. America, Russia, France, Britain, China, India, Pakistan and presumably Israel all have military nuclear operations which are useless to humanity and need to be stopped forever. More than 30 countries have nuclear power plants. None have solutions to their growing waste problems. Instead, industry research and development goes into making more dangerous higher burnup fuels and new nuclear reactor designs, without any consideration or solution as to how to store the nuclear waste. Reprocessing nuclear waste is uneconomical and dangerous and still results in piles of deadly nuclear waste with no storage solution. In the "think globally, act locally" theme, it's definitely well past time for California to stop generating nuclear waste. It's a hot potato Californians can't get rid of, therefore, we should close the Diablo Canyon nuclear power plant NOW. We should not wait for relicensing in the next decade, in the hope that then, the NRC will do its job. The NRC has NEVER stopped a relicensing of a nuclear power plant. Not once. Even San Onofre, broken and dilapidated, was on the verge of being relicensed by the NRC to operate at 70% power level. At least a year earlier the NRC could have said there was no way it would ever allow that, and saved ratepayers in California hundreds of millions of dollars in upkeep of a broken and non-operating pair of reactors. They didn't. It's not wise to expect the NRC to do an about-face and "realize" we don't need Indian Point, or Diablo Canyon, or any other nuclear reactor. The states and local communities MUST force these plants to close. It is every level of government's duty to prevent danger to the citizens they work for. Nothing is more dangerous than a nuclear reactor in our midst! Because new commercial-size nuclear reactors are so over-budget, and because transmission lines are so difficult to build due to local opposition, and because rich people like to gather in their own separate communities, there is currently a push for experimental "Small Modular Reactors." SMRs will be far less efficient, and far more expensive per kilowatt of power produced, than large commercial power reactors. But their development is being funded by the government, and rich people want one on every private island and in every gated community. The waste from SMRs will be just as deadly as commercial nuclear reactor waste. SMRs will be far more vulnerable to terrorism, as well as to accidental airplane strikes, since they will not have the same level of containment building (which, by the way, wouldn't stop a large aircraft or determined terrorists anyway). SMRs wouldn't stand a chance in today's market place, but natural gas prices are expected to soar in the coming years, especially if fracking is banned (as it should be, to protect our groundwater). People who back SMRs don't believe renewable energy will EVER be able to compete, even though it can -- and does -- right now (but they do believe in government handouts). The nuclear industry is still very bullish on themselves, and it's time for the public to grasp the dangers that old technology is posing for humanity. Could Yucca Mountain, Nev., be revived as a possible site? Published: Dec. 27, 2013 Updated: 2:52 p.m. So is Yucca Mountain really, truly, as dead as a doornail? Or might it rise, bloodied and zombie-like, from a shallow grave? • a federal appeals court told the government to quit collecting $750 million a year from consumers for said Nuclear Waste Fund, since, you know, the federal government has failed to permanently dispose of a single gram of nuclear waste for more than 50 years. This all comes as the city of San Clemente officially implores the federal government to create some sort of safe repository for nuclear waste, and to give first priority to the stuff stored at San Onofre Nuclear Generating Station because of our area's "unique circumstances" (read: vulnerability to earthquakes and dense population). "I'll take any sign of forward momentum on Yucca Mountain as positive, including this one," said San Clemente City Councilwoman Lori Donchak by email shortly after the news broke. "The immediate need is for a safety-evaluation report to see if the site can do its job. It's not clear that the money available is enough to get that done and unfortunately no indicators that renewed funding is in the works in Washington. "For an initiative of this size, $11 million … really doesn't go very far at all," she said. "I want to believe that this is more than a legal formality and a sign that Yucca is getting a serious second look." There are those who agree on Yucca-as-the-answer, and those who don't. But the importance of some sort of answer to the nation's acute nuclear-waste-disposal-question grows more pressing every day: Some 70,000 metric tons of the poisonous stuff have piled up in pools and dry casks all across America, and more than 116 million people live within the 10-mile evacuation zone around the nuclear power plants that have created it. That's more than one of every three people in the United States. And the financial cost of paralysis is high: About 80 lawsuits have been filed against the feds over broken promises to start accepting spent nuclear fuel by 1998, the Department of Energy had paid out $2.6 billion in damages to utility companies as of 2012, and it faces another $19.7 billion in liabilities through 2020, according to the General Accounting Office. Anyone looking for a case study illustrating the inefficiencies of the democratic system might well choose the Yucca Mountain debacle. In short, it goes something like this: Congress passes Nuclear Waste Policy Act in 1982. President Ronald Reagan signs it into law. The NRC "shall consider" the Department of Energy's license application to store nuclear waste at Yucca Mountain, and "shall issue a final decision approving or disapproving" that application within three to four years of its submission, the act states. So the DOE submits Yucca license application to the NRC in 2008 ­ but the political wheels have long been grinding. The good folks of Nevada don't want the nation's nuclear garbage in their backyard. The Obama administration is sympathetic, and the DOE withdraws its application. Funding for development of a Yucca Mountain waste site is terminated in 2010 "for political, not technical or safety reasons," according to the GAO. "Although the Commission had a duty to act on the application and the means to fulfill that duty, former (NRC) Chairman Gregory Jaczko orchestrated a systematic campaign of noncompliance," wrote a federal judge. "Jaczko unilaterally ordered Commission staff to terminate the review process in October 2010; instructed staff to remove key findings from reports evaluating the Yucca Mountain site; and ignored the will of his fellow Commissioners." So the deadline for approving or disapproving Yucca comes and goes. "(T)he Nuclear Regulatory Commission has continued to violate the law governing the Yucca Mountain licensing process," said the U.S. Court of Appeals for the District of Columbia Circuit when it ordered the NRC to move its tuchis in August. "This case raises significant questions about the scope of the Executive's authority to disregard federal statutes." The NRC dragged its feet because it suspected that Congress won't appropriate the additional funds needed to complete the licensing process ­ a heck of a lot more than $11 million ­ and so it would be a waste to continue the process now, the court noted. "The Commission's political prognostication may or may not ultimately prove to be correct," the court said. "Regardless, an agency may not rely on political guesswork about future congressional appropriations as a basis for violating existing legal mandates. A judicial green light for such a step ­ allowing agencies to ignore statutory mandates and prohibitions based on agency speculation about future congressional action ­ would gravely upset the balance of powers between the Branches and represent a major and unwarranted expansion of the Executive's power at the expense of Congress." And that is how, last month, the NRC came to tell its staff to get moving on the safety evaluation report of Yucca. But don't get confused: Finishing the safety evaluation report does not restart hearings on the licensing application, or signal that a licensing decision is imminent, the NRC said. It could take about a year to finish the work, but the Commission did not set a deadline, said NRC spokesman David McIntyre. Which brings us to the other matter: the Nuclear Waste Fund, created by the aforementioned Nuclear Waste Policy Act in 1982 (where that $11 million for the Yucca study now resides). The federal government promised to take care of this rather important waste-disposal detail decades ago ­ for San Onofre and all commercial nuclear power plants ­ and has been requiring consumers to pay for permanent storage of nuclear waste since the 1980s, even though it has failed to permanently dispose of a single ounce of spent nuclear fuel. While the reactors were humming, SCE's customers paid about $16 million a year into the Nuclear Waste Fund ­ which is a 10th of a cent for each kilowatt hour generated. All told, Southern Californians have pumped close to a half-billion dollars into the fund, for a service the federal government has never provided, and isn't even close to providing. So the Nuclear Waste Fund has swollen to $30 billion, and now earns nearly twice as much in interest ($1.3 billion a year) as it collects from the customers of utilities operating nuclear plants ($750 million a year), to fund a nonexistent service. The utilities sued, arguing that they should not be forced to collect this fee from customers for a service the federal government is not providing. And they won. "Petitioners, a group of nuclear power plant operators, appear again before us to claim, essentially, that so long as the government has no viable alternative to Yucca Mountain as a depository for nuclear waste, they should not be charged an annual fee to cover the cost of that disposal," wrote a federal judge last month. "We agree." The court is "not unaware of the political dilemma" in which the Department of Energy finds itself, the judge wrote. "But until the Department comes to some conclusion as to how nuclear wastes are to be deposited permanently, it seems quite unfair to force petitioners to pay fees for a hypothetical option, the costs of which might well ­ the government apparently has no idea ­ be already covered." Going forward with a study of Yucca ­ when it's unclear if Yucca will ever be viable ­ leaves many with mixed feelings. "It seems prudent to complete the study before any final decision is made," said Gary Headrick of San Clemente Green by email. "The investment we have made there is not the biggest loss if it is to be closed. It is the lost opportunity to have a permanent repository for nuclear waste that poses a major threat to the environment every day that it sits on the surface instead of deep underground. This is a setback that may result in a delay that lasts longer than dry cask storage was intended to last. "What do we do if dry casks begin to fail and there is nowhere to take them?" Headrick continued. "I'd like to see our government prioritize deep geologic storage and improved temporary storage that can be more readily transported and repackaged if needed. One or the other needs to be in place in about 20 years at the most, when containers that have been in service for several years begin to reach their intended lifespan. It is a ticking time bomb, but no one seems to be treating it as such." Many are shaking their heads. "My initial response on Yucca Mountain was, 'Great, let's get this stuff out of SoCal,' " said activist Joe Holtzman of Mission Viejo by email. "However, after studying the issues of Yucca Mountain, particularly moisture seepage, I am no longer a proponent. ... This looks like another Federal Government project that was from the beginning poorly researched, poorly planned, and poorly executed." Earlier this year, Sen. Dianne Feinstein, D-Calif., and three other senators introduced the Nuclear Waste Administration Act of 2013, hailing it as "a bipartisan, comprehensive plan for safeguarding and permanently disposing of tens of thousands of tons of dangerous radioactive nuclear waste currently accumulating at sites dispersed across the country." It would essentially yank all responsibility from the Department of Energy; create a new organization solely devoted to solving the nuclear waste storage and disposal problem; and develop a "consensual process" for figuring out where to actually put nuclear waste by engaging with willing, rather than unwilling, communities (thus hoping to avoid the Yucca Mountain gridlock). Hearings were held in July in the Senate's Committee on Energy and Natural Resources. There are glimmers of hope that ­ more than 30 years after the Nuclear Waste Policy Act passed, and 15 years after the feds guaranteed they'd start accepting the waste ­ paralysis and dithering might give way to action. But there's a long way to go. Some experts fear that the proposal would add a new layer of bureaucracy; others fear it would institutionalize short-term storage over long-term storage. Which is precisely where we are today. "Yucca Mountain is an imperfect solution," said activist Ace Hoffman of Carlsbad by email. "Geologic storage, if we choose that route, will not be easy and will not be risk free. And we're nowhere near it at this point. ... Instead, we've apparently chosen to practically randomly assign approximately 75 sites around the country to be nearly-permanent or virtually-permanent (100s of years, which only George Orwell and the NRC can call temporary) nuclear waste dumps. SanO is one of them." • American's nuclear industry has produced about 70,000 metric tons of highly radioactive spent nuclear fuel. • About 1,600 metric tons of it is at the now-closed San Onofre Nuclear Generating Station. • At San Onofre, about 2,550 spent fuel assemblies cool in spent fuel pools. • An additional 1,200 or so are entombed in sealed stainless steel canisters housed in reinforced concrete ("dry cask storage"). • Electricity consumers have kicked in more than $35 billion since 1982 for permanent waste storage, but the federal government has failed to permanently dispose of a single gram of highly radioactive nuclear waste. • The U.S. Department of Energy was recently ordered to stop collecting more than$750 million per year from consumers for the disposal fund, since there is no disposal going on. • The disposal fund has a balance of about $30 billion and it accrues more than $1 billion per year in interest income.